Background: Cancer of the bladder is the ninth leading cause of cancer in developed countries. It is the second most common urological malignancy. Transitional cell carcinoma (TCC) is the most common histological subtype in developed countries. In most of Africa, the most common type is squamous cell carcinoma (SCC). 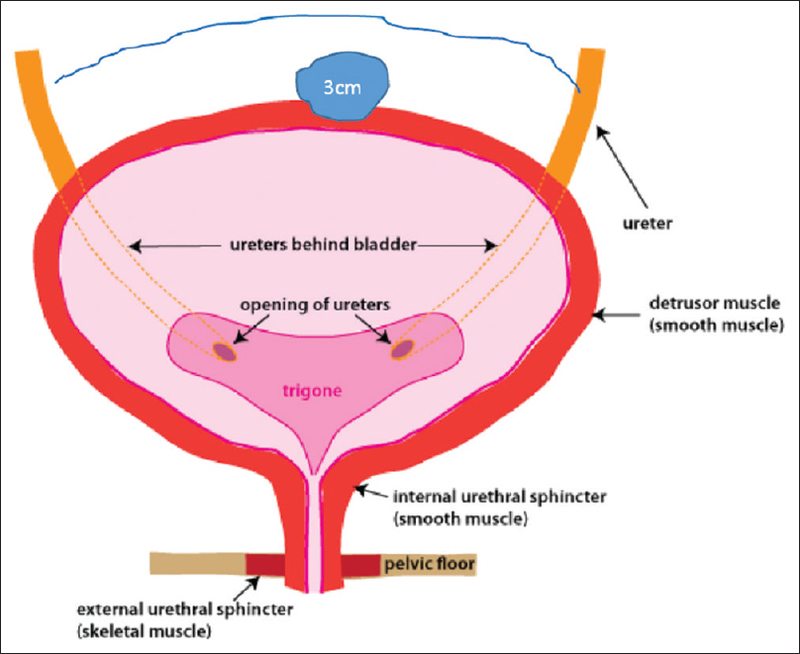 Cancer of bladder guidelines produced by the European Urological Association and the American Urological Association, including the tumor, node, and metastasis staging is focused on TCC of the bladder. Objectives: The purpose of the study is to review the pathogenesis, pathology, presentation, and management of cancer of the bladder in Africa and to use this information to propose a practical staging system for SCC. Methods: The study used the meta-analysis guideline provided by PRISMA using bladder cancer in Africa as the key search word. The study collected articles available on PubMed as of July 2017, Africa Online and Africa Index Medicus. 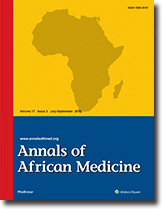 PRISMA guidelines were used to screen for full-length hospital-based articles on cancer of the bladder in Africa. These articles were analyzed under four subcategories which were pathogenesis, pathology, clinical presentation, and management. The information extracted was pooled and used to propose a practical staging system for use in African settings. Results: The result of evaluation of 821 articles yielded 23 full-length papers on hospital-based studies of cancer of the bladder in Africa. Cancer of the bladder in most of Africa is still predominantly SCC (53%–69%). There has been a notable increase in TCC in Africa (9%–41%). The pathogenesis is mostly schistosoma-related SCC presents late with painful hematuria and necroturia (20%). SCC responds poorly to chemotherapy or radiotherapy. The main management of SCC is open surgery. This review allowed for a practical organ-based stage of SCC of the bladder that can be used in Africa. Conclusion: Bladder cancer in Africa presents differently from that in developed countries. Guidelines on cancer of the bladder may need to take account of this to improve bladder cancer management in Africa. Background: Urolithiasis may result in many complications including renal failure. There is a paucity of documented scientific study on the prevalence of urolithiasis in the University of Abuja Teaching Hospital within the Federal Capital Territory, Nigeria. The aim of the study was to assess the prevalence of urolithiasis in patients undergoing ultrasound at University of Abuja Teaching Hospital. 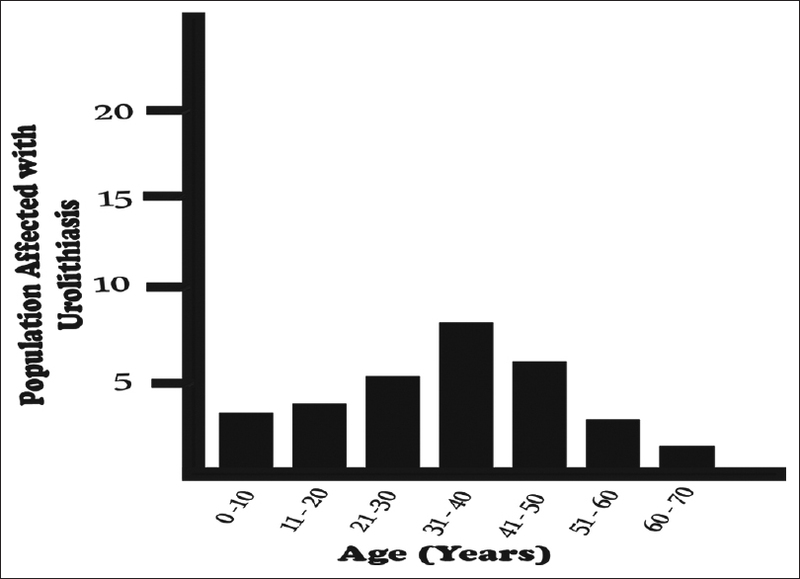 Materials and Methods: This study which adopted a survey approach was conducted at the Department of Radiology, University of Abuja Teaching Hospital between June 2014 and May 2015. A total of 2310 patients that underwent abdominopelvic ultrasound in the department who aged between 2 and 64 years and met the inclusion criteria participated in the study. They were recruited using a convenience (nonprobability) sampling technique. Data obtained were subjected to descriptive statistics and analyzed using Student's t-test. P < 0.05 was considered statistically significant. Results: A total of 2310 patients were scanned, 31 patients were sonographically identified with urolithiasis. The prevalence of urolithiasis was 13.4/1000. The mean age was 31.12 ± 3.69 years. There were 58.06% males and 41.93% females giving a male-to-female ratio of 1.3:1. The peak age of incidence was 21–50 years. Majority (22 [71%]) were located in the upper urinary tract, whereas 9 (27%) were in the lower urinary tract. The most common presenting symptoms were flank/loin pains (renal colic) noted in 12 (40%) patients, followed by hematuria in 4 (13.3%) patients. Conclusion: The prevalence of urolithiasis was 13.4/1000. This information can be utilized in formulating future health plans for prevention of urolithiasis in the hospitals within this locality. Background: Wounds are commonly encountered in the clinical practice. Microbacterial colonization and infection negatively affect wound outcomes. With increasing emergence of antibiotic-resistant strains, it is essential to determine local patterns of wound microbiological profile and antibiotic susceptibility to guide rational empirical antibiotic use. Materials and Methods: Consecutive patients who presented to the plastic surgery unit were recruited to the study over a 6-month period. Wound swab cultures were performed at presentation using standard protocols and media. The wound swab was performed by the Levine technique and data were analyzed using a statistical software package. Results: Eighty-five microbial isolates were obtained from the eighty patients (55 males and 25 females) recruited. Gram-positive isolates were 35 (41.2%) and Gram-negative were 50 (58.8%). There was equal distribution of acute and chronic wounds. 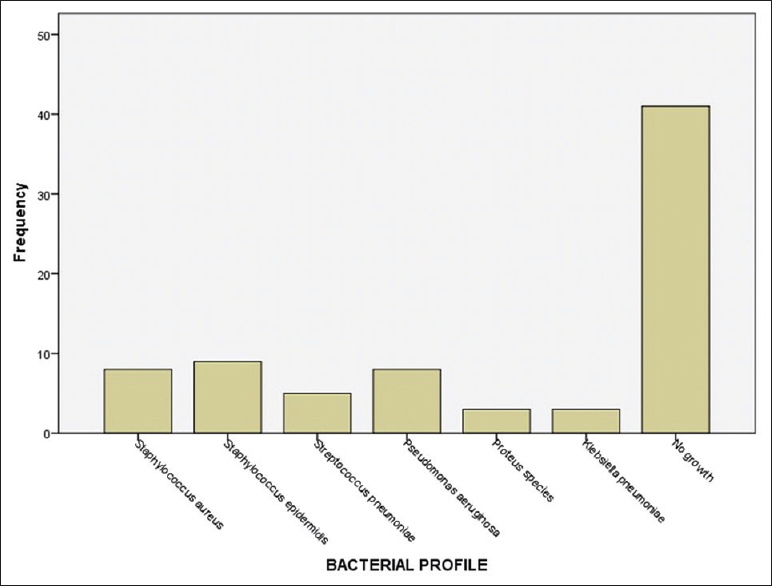 Pseudomonas aeruginosa was the most common isolate at 30.6%, followed by Staphylococcus aureus (27.1%), Escherichia coli (9.4%), Streptococcus species (8.2%), and Morganella morganii (7.1%). The isolates demonstrated resistance to amoxicillin-clavulanate, ampicillin, cloxacillin, cefuroxime, ceftazidime; low-to-moderate sensitivity to erythromycin, gentamicin, streptomycin, tetracycline, ciprofloxacin, and ofloxacin; and a moderate sensitivity to ceftriaxone and a high sensitivity to imipenem. There was significant difference in antibiotic resistance patterns between Gram-positive isolates from acute and chronic wound infections but not for acute and chronic wound Gram-negative isolates. Conclusion: Most of the microbial isolates, particularly the Gram-negative isolates demonstrated low sensitivity to commonly used antibiotics and moderate-to-high sensitivity to less commonly used newer antibiotics. Background: Breast carcinoma is a major cause of mortality among women worldwide. Early detection and cure is the key to reduce the mortality of the disease. This article studied the role of high resolution ultrasound in detection and characterization of lesions to complement mammographic diagnosis and improve patient management. Aims and Objectives: To evaluate the role of complementary high resolution ultrasound, BIRADS scoring and to correlate it with histological diagnosis. Results and Observations: HRUS is excellent in detecting microcalcifications, malignant features of solid masses, differentiating focal asymmetry from masses, differentiating between solid and cystic lesions, simple and complex cysts and detecting satellite lesions and mammographically inaccessible areas for which special views can be done. Conclusions: Every case referred for digital mammography should undergo ultrasound irrespective of the age, symptoms and density of the breast parenchyma and a combined final BIRADS grading should be done. Ultrasound is an excellent imaging modality for breast lesions in expert hands. Background: In resource-scarce settings like Nigeria, access to conventional drugs and antiretroviral therapy (ART) is highly limited, hence the resort to use of traditional herbal medicine by a significant number of people living with human immunodeficiency virus and acquired immunodeficiency syndrome (HIV/AIDS) (PLWHAs). Traditional medicine (TM) continues to provide health coverage for most of the people in developing countries, and it is equally becoming increasingly popular in western countries. Aim: This study aims to present the status and use of TM and determine the factors associated with its use among patients with HIV/AIDS on highly active ART in a tertiary health institution in Sokoto, Northwest Nigeria. Methodology: This was a descriptive, cross-sectional study involving HIV/AIDS patients attending antiretroviral treatment center of the Usmanu Danfodiyo University Teaching Hospital (UDUTH), Sokoto, Nigeria. The study population comprised PLWHAs attending the ART clinic of the hospital (UDUTH). A total of 271 respondents were recruited into the study and administered a set of pretested structured questionnaire. Ethical approval for this study was obtained from the ethical committee of the teaching hospital. Results: Only 11 (4.2%) of the respondents had used TM before, of whom 9 (5%) were females and 2 (2.7%) were males with P = 0.399. Only one of the respondents had side effects following the use of TM, and the most common reason for the use of TM was as a result of too much weight loss. Conclusion: Although the use of TM among the study participants in Sokoto was low, there is need to educate PLWHAs about the possible risks of interactions following the concurrent use of TM and ART. 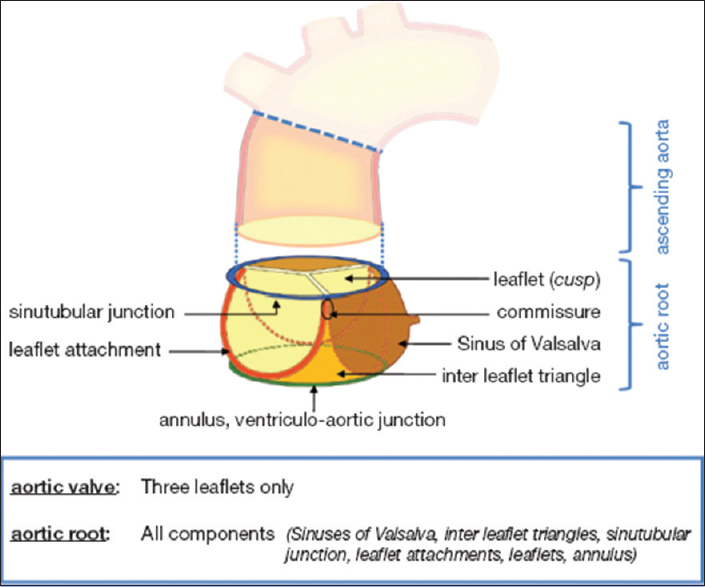 Background: The aortic root is an aggregate of various components that connects the left ventricle to the aorta. The most predominant pathologies have been associated with the dilation of the aortic root leading to aneurysms. Aim: This study is designed to measure the role of systemic morbidities such as hypertension, diabetes, and body mass index (BMI) on the dimension of the aortic root. Materials and Methods: Participants were volunteers of African descent who were recruited during and after an organized health fair by the medical students' body from All Saints University, School of Medicine. 169 participants consisting of 62 males and 107 females with ages ranging from 9 to 84 years agreed to volunteer by signing the consent after which a questionnaire was administered and a preliminary clinical procedure was used to check for blood pressure (BP), blood glucose (BG), and BMI. The measurement of the aortic root was carried out by an experienced single investigator who was not aware of the purpose of measurements, using a DUS-5000 ultrasound machine (Miami, Florida, USA) at a low-frequency micro-convex transducer preset to “adult cardiac” with a default frequency of 4 MHz. Results: Among the participants, 35.03%, 47.80%, and 29.11% had normal BP, BG, and BMI readings, respectively. The Chi-squared analysis identified a significant correlation between the diameter of the aortic annulus (AA) and BMI. Diastolic BP is also correlated with the diameter of the AA. Sinus of Valsalva (SV) showed an unusual correlation with BG as opposed to BP and BMI. Conclusion: The disparity in how a systemic factor individually correlates with the AA and the SV is not clear. The study targets to provide educational concept in this regard. Background: Surgery is the most common source of acute pain. Aim: To determine the intensity of acute pain following day case surgery and evaluate the effectiveness of the prescribed analgesics. Methods: A descriptive observational study carried out at the main operating and the Urology Outpatient theatre suites of the University College Hospital, Ibadan. Seventy consecutive adult patients presenting for day case surgeries between July and September 2013 were recruited. The procedures were stratified as follows: peripheral, groin/perineal, urologic/endoscopy or orthopedic/plastic surgeries. The prescribed postoperative oral analgesics were paracetamol alone or in combination with diclofenac, tramadol or both. Postoperative pain intensity was assessed on arrival in the recovery room and at 6, 12, 24, 48, & 72 hours using the Verbal Intensity Pain Scale (VIPS). The pain scores were presented as mean±SD at different time intervals for each stratified surgical procedures and analgesics using tables and frequency bar charts. 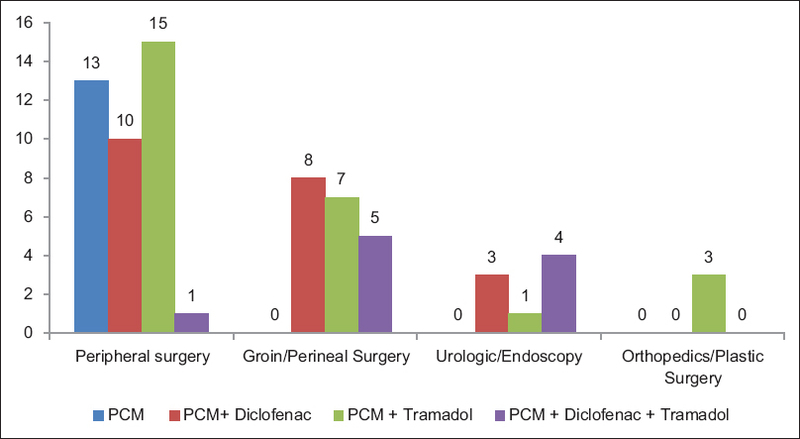 A mean pain score of less than 2 for each category of surgical procedures or analgesics group was considered as satisfactory pain control and thus effective analgesia. Result: The overall prevalence of moderate to worst possible pain after surgery in this study was 54.3% on arrival in the recovery room. The mean pain score was greater than 2 at 6 hours postoperative in all surgical categories except in patients who had peripheral surgeries irrespective of single or combination analgesic therapy. Conclusion: A high proportion of patients arrived in the recovery room with a high pain score; measures to improve intraoperative analgesia should be employed. Objective: The purpose of this study is to compare the success rate of vaginal birth after cesarean (VBAC) in spontaneous and induced labor. Design: This is an 8-year retrospective comparative study. Setting: University hospital. Population: Five hundred and ninety-four women who had one previous lower segment cesarean delivery. Materials and Methods: This is a retrospective study of all women, who had lower segment cesarean section, admitted for trial of labor between April 2010 and November 2016. Five hundred and sixty-seven women who elected to have trial of labor after one previous cesarean were included in the study, of these 477 (84.13%) had spontaneous onset of labor (control group) and 90 (15.87%) had induction of labor (IOL) (study group). Two hundred and seventy-seven women had no previous vaginal delivery, and 297 had one previous vaginal delivery. Results: We compared the success rates of VBAC in women who had IOL with those who came with spontaneous labor. The rate of vaginal delivery after CS (VBAC) was 50.0% and 66.6% in the study and control groups, respectively. There was a significant increase in the rate of cesarean delivery due to fetal distress in the study group (P = 0.016). There were no cases of uterine rupture in the control group and one case in the study group. Patients who had spontaneous labor and at least one previous vaginal delivery have higher success rate of vaginal delivery. Conclusion: Women with one previous CS, who undergo IOL, have lower success rates of vaginal delivery compared with those who presented in spontaneous labor. They also have higher risk of CS delivery due to fetal distress. Previous normal vaginal delivery increases the success rate of VBAC. Purpose: The purpose of this study is to determine predisposing factors, common bacterial causes, and antibiotic sensitivity of corneal ulcers in Murtala Muhammad Specialist Hospital. Materials and Methods: A prospective, cross-sectional, observational study was carried out on patients with corneal ulcers. Information on relevant clinical, sociodemographic profile was obtained. Examination includes visual acuity test and slit-lamp biomicroscopy, especially fluorescein staining. Corneal scrapings from the ulcer were inoculated onto the selected solid culture media plates. Gram staining for microscopic examination was done. Antibiotic sensitivity test on different antibiograms was done using modified Kirby–Bauer technique, determining bacterial isolate sensitivity or resistance to relevant antibiotics (chloramphenicol, ciprofloxacin, ofloxacin, gentamicin, tetracycline, ceftazidime, ceftriaxone, cefotaxime, and penicillin). Results: A total of 77 patients with corneal ulcer were examined. Ocular trauma, application of harmful traditional eye medication, and use of unspecified topical medication before presentation were among the predisposing factors. Bacterial growth was seen in 46.8% of the samples, of which 28.6% of the growth were Gram-positive. The common bacteria isolated were Staphylococcus epidermidis, Staphylococcus aureus, Pseudomonas aeruginosa, Streptococcus pneumoniae, Proteus species, and Klebsiella pneumoniae. Isolates were sensitive to ciprofloxacin and ofloxacin while an intermediate sensitivity was seen with chloramphenicol and gentamicin. Isolates were resistant to tetracycline, ceftazidime, ceftriaxone, cefotaxime, and penicillin. Conclusion: Ocular trauma was the major predisposing factor to corneal ulcer, and Staphylococcus species was the major bacterial organism isolated. Isolates were found to be sensitive to ciprofloxacin and ofloxacin, while an intermediate sensitivity was seen with chloramphenicol and gentamicin. Emotionalism is the abnormal expression of emotions like crying and laughing and could follow stroke, traumatic brain injury, multiple sclerosis and amyotrophic lateral sclerosis. Emotionalism has been known to respond therapeutically to different classes of drugs including tricyclic antidepressants like imipramine, Selective Serotonin Reuptake Inhibitors (SSRI) like sertraline and citalopram, anticonvulsants like lamotrigine, dopamine precursors like levodopa and NMDA receptor antagonists like dextromethorphan. Classical antipsychotics are hardly prescribed for emotionalism alone without psychotic features. In this case report, an eighty year old woman with a dominant fronto-temporal infarctive stroke with right faciohemiparesis presented with frequent crying (dacrystic) episodes after a month of onset of stroke and who did not satisfy DSM IV criteria for depression nor had other psychotic features. Serial trial of SSRIs and dextromethorphan/quinidine could not help until risperidone, an antipsychotic was introduced with resolution of crying episodes. The response to risperidone after trial of SSRIs and dextromethorphan/quinidine which are considered the gold standard for post-stroke emotionalism (PSE), could be another therapeutic dimension in the management of emotionalism in general and PSE in particular.